I'll admit, when I first started working out, I had no idea there were things like pre-workout & post-workout supplements, pills, shakes, powders, liquids...enough to make a girl go dizzy! There's so much information on all this stuff too that even when trying to do "research" I ended up more confused than when I started. So, what did I do? I asked around. Word of mouth was going to be the best way for me to figure it out. I tried a few things that people I knew recommended and found a pre-workout supplement that worked for me. So, when I signed up for the Rock N Roll Half Marathon here in Las Vegas, I knew I wanted to try out some running fuels, but again, was lost with all the options available and I went back to what worked before, word of mouth. I'm involved with my local chapter of Moms Run this Town and someone mentioned Island Boost on our facebook page and I quickly looked it up. I liked that it doesn't have artificial sweeteners and is vegan & gluten free, since clean eating is so important to me. When I got the opportunity to be one of the first to try out their new chocolate flavor, I was beyond excited! This stuff is good! It tastes like a chocolate yoohoo (yum)! I was seriously squeezing it to try and get every single drop! I like that it's not too thick or sticky, like other running fuels I've tried. Another thing I really like is that it's made with premium, real ingredients I can pronounce and one packet is only 70 calories. They claim it's fast and after trying it myself I can now say it really is fast. I noticed the boost of energy right away during my long runs. Here's what I don't like: this new flavor won't be available until February 2014! I can't wait to get some more, but until then I'll be trying out their other flavors, Passion, Aspire, and Renegade. 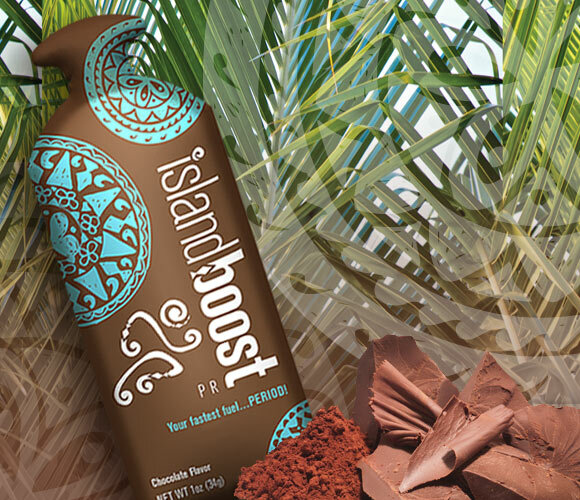 Posted in Fitness and tagged with island boost, island boost review, running, run, half marathon, marathon training. October 24, 2013 by Jessie Emeric.